If like me, you get frustrated with the accumulating grime in your white and pristine Macbook, the simple solution to that is good old Mr. Clean! But not the laundry soap silly! When I first got my Mac, I made sure I washed my hands before using it. But for some reason, the space on each side of the trackpad where my palms usually rest would still turn into a revolting grayish/brownish dirty color. Good thing I heard of Mr. Clean Magic Eraser, thanks to my future sis-in-law Lorr! It's just perfect for removing dirt and grime that have accumulated on a once snowy white Mac. And its very simple to use. Just add water! Really! 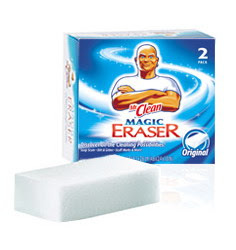 According to the company website, "Mr. Clean Magic Eraser® is a soft cleaning pad that acts just like an eraser. Its innovative cleaning material cleans tough dirt, lifting it away from surfaces all over your home. Try it on soap scum, marks on walls, inside microwaves or even on car wheels." And if I may add, your laptops as well! Now if you like wearing white tops or shorts or pants or dresses or whatever, you may have noticed that Murphy's Law almost always takes into effect. But to mitigate the chances of a permanent stain ruining your favorite whities, it makes total sense to bring along some bleach in your purse. You doubt it? Don't! With Clorox® Bleach Pen® Gel you can "Bleach only what you want, where you want." This is because "Clorox® Bleach Pen® Gel cleans with the power of bleach, but comes in a handy, pen-like tool. Its dual-tipped applicator has a fine point for precise jobs and a scrub brush for larger ones...it is perfect for removing stains from the white areas of your striped, floral, and patterned clothes because you put the bleach exactly where you want it." This bleach is so potent that, let's put it this way, it can remove months old stains! One time, I was so bored that I decided to bleach a stubborn stain on a pair of white pants I was wearing that day. Just for kicks you know. (We're not supposed to do that, as the product coming into contact with skin may cause irritation, but I still would for extreme emergency situations). Like magic, the stain dissolved in a flash! These handy dandy helpers are available at True Value, but you can also check out Handyman and Ace Hardware for stocks. Mr. Clean Magic Eraser retails for about Php300 and Clorox® Bleach Pen® Gel is about Php400-Php500. Hi. Another cleaner that works on Macbooks, particularly the white variety, would be a non-acetone-based nail polish remover. This drugstore solution takes care of stubborn stains and does an immensely better job over the iKlear sold in Apple stores. It can even take out stains from smoke, which are pretty nasty on a Macbook. (I speak from a particularly memorable fire incident over the holidays.) Take note, it should be the non-acetone type, otherwise the chemicals will eat away at the polymer. :-) Thanks for the tip. Thanks for sharing too! =) Where can you get a non-acetone based nail polish remover? Most of the stuff I see around are of the acetone variety.